Erwin and the Scouts prepare to take back Wall Maria. They receive a rousing cheer from the citizens as they ride off. Season Hiatus. Episode 49 - "Night of the Battle to Retake the Wall"
First, some housekeeping. The next episode of Attack on Titan will be in Spring 2019, so you've got a long wait. And, instead of a preview, even though the episode said "to be continued" at the end, the producers reminded you that this is a monster movie and interrupted the end credits with a very disturbing scene. You see that title up there? That's wrong. The title should have been "Death Flags for Erwin." Hell, it should have been "Death Flags for Everyone." Erwin insisted on leading the mission, against Levi's threats. 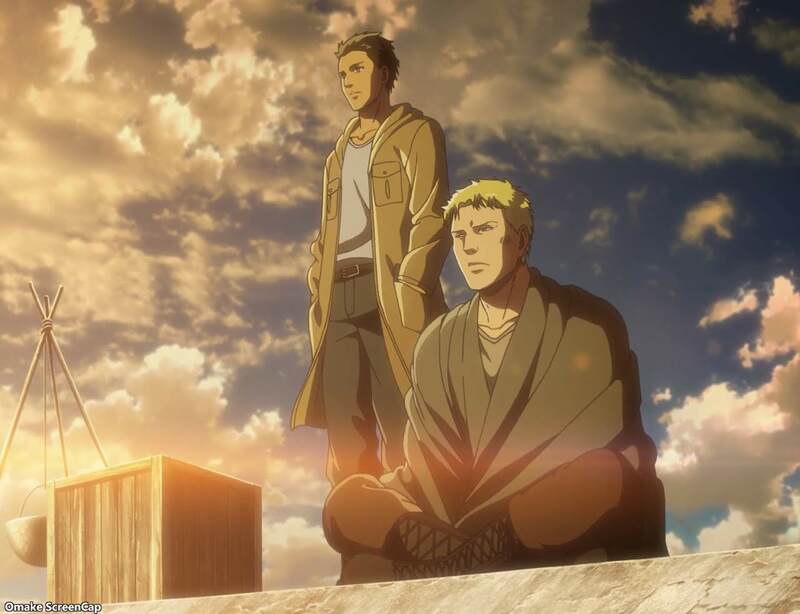 Erwin declared that his need to see what was in Grisha Jaeger's basement was more important than his life and the sake of the military and the people. Those people cheered for the Scouts as they prepared to leave on their Wall mission, which had never happened before. Erwin led the cheer back to the people. Then they showed that scene of Levi losing his self control with Eren. What do you think is the only thing that could make that happen? Oh, how about Erwin getting gravely wounded, Levi trying to use the Titan serum on him, and Eren stopping him? Now, I just watch the anime and I don't read the manga, so this is all my own speculation, but something very bad is going to happen to Erwin before that Wall is taken back. And we won't find out for at least another 6 months! Hange can't analyze the serum because air vaporizes it, so they decide to give it to Levi who has the judgment to use it, and whom to inject, in a dire situation. Hey, that's a death flag! Zachary still want to show off his "art." Yeah, no. At least the other members of the council know the public favor would drop even more against the military if he did that. Erwin says it's all about Grisha's basement. Hange seems to think he was from a different Titan faction than Bertholdt and Reiner, but he was a dedicated agent searching for the royal family's secrets. Levi really doesn't want Erwin to go on this mission with his one arm. Erwin convinces Levi to let him, even with the threat of losing his legs. Erwin wants to get in that basement at all cost, mainly motivated by the disappearance of his father. Hey, that's another death flag! It's a big mission, so let the army have some meat. But shhhh, don't let the public know. Ha! Hahahaha! I haven't laughed this hard all season. These people are going crazy for meat! My God! Sasha! Don't chomp on Jean's hand. He called her Potato Girl! Yeah! Even Jean and Eren are roughing each other up! This is hilarious! Nobody's stopping the fight! They're just letting them go at it! Because Eren is feeling "spunky." They don't even want to fight any more. Levi doesn't care. Levi's specialty is cleaning up messes. Oh, that's one disappointment I had with the truncated Kenny arc - we never saw how Levi turned into a neat freak. Aw. Now that Historia is the queen, she can't join in on this fight and headbutt people. Jean makes good point to Marlowe about recruits staying in the back during a fight. If they put them in the front, they'd be too dead to learn anything. Point of order - Armin talking about looking at the sea is not a death flag. He's only been talking about this for three years. Eren still doesn't believe him about different environments, but the flash forward from the first episode of the season showed Eren at the beach, so... bring on 2019 already! Levi enjoyed listening in on the kids' conversation. Is that a death flag for him? It's time. Erwin has to salute with his other hand. Erwin sees Jean, Conny, and Sasha cheering back at the crowd. Says they've never been cheered like this. He yells back too! Guh, that's another death flag, right? Did Erwin's plan account for Bertholdt and Reiner? And that Beast Titan guy will be behind the Wall chucking boulders, I'm sure. Also, the Beast Titan can make the other Titans fight at night, so does the plan deal with that too? Whoa. That's a monster movie trick with the end credits. This is a disturbing scene. Levi is mad at Eren, who just got out of his Titan form. There's somebody steaming on the roof too, and everyone is crying. Did, did Eren just kill a Titan Erwin? This is a good season hiatus cliffhanger! Next time is April 2019. See you then!